Everyone knows about the Twilight Saga books that have been turned into movies. They are some of the most popular and entertaining books and movies in the world today. 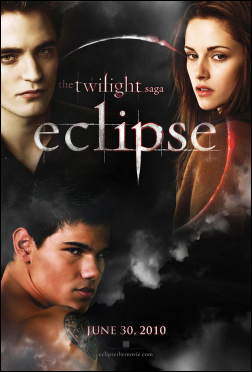 As most of us probably know, the first two movies - Twilight and New Moon - opened to huge numbers, and Eclipse was no different. For those who don't know what the craze about these vampires and werewolves is all about, it comes down to a vampire named Edward Cullen (played by Robert Pattinson) who is in love with a human named Bella (played by Kristen Stewart). Throughout the story, particular in the second movie New Moon, Bella becomes best friends with Jacob (played by Taylor Lautner) who is in love with Bella. So you can imagine the conflict here, because it is a classic love triangle with a twist, and that is the fact that Jacob the werewolf and Edward the vampire are mortal enemies. The story line in each movie is always a little bit different, but for the most part centers on these three main characters and their families. Bella realizes something in this third installment that she had never realized before, and it makes for one interesting movie. 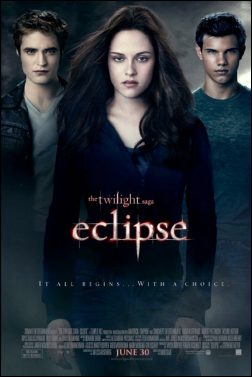 The third installment of the Twilight Saga, Eclipse, is not only about the love triangle between Edward, Bella, and Jacob, but there are newborn vampires running around killing humans and coming after Bella herself. I don't want to give anything away for the people who haven't read the book or seen the movie yet, but I can say that there is a lot of action involved when two mortal enemies have to work together to protect the one they love the most. Both Edward's family and Jacob's wolf pack are involved in the story all the way through to make a very interesting 2 hour and 5 minute story come to life. I truly thought Eclipse was the best movie of the three. I am one of those people who has read the book first before going to see the movie, and I must say that this is the movie that did almost everything that the book did, and I think that's what makes it even better. One of the only things I did not like about Eclipse was the ending. I will just say, without giving anything away, that they could have done the ending way better. The action in Eclipse is one of the main things that kept it interesting because it was pure. The way the directors kept the cameras moving is what also helped make the movie lively and never boring - there was a lot of motion, but not too much to the point where you would get dizzy. I would surely recommend Eclipse to anyone who likes a good love story with some action as well. I give Eclipse 4 stars (of a possible 5). It was really interesting and did not let me fall asleep, but the ending really did not do the book justice at all.